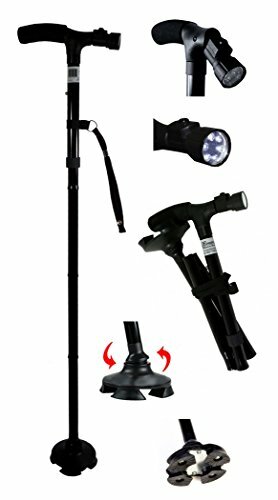 Sturdy Lightweight Folding Cane/Walking Stick features a Pivoting Self-standing Quad Base, Adjustable LED Light & Cushion Handle by Enable Medical Supply at Get Cheap Health Insurance. MPN: JL9274L. Hurry! Limited time offer. Offer valid only while supplies last. The Enable Medical Supply Sturdy Lightweight Folding Cane/Walking Stick is the perfect Fall Prevention and Mobility Aid for home and on the go. The Enable Medical Supply Sturdy Lightweight Folding Cane/Walking Stick is the perfect Fall Prevention and Mobility Aid for home and on the go. Perfect for Men and Women, Seniors, Disabled, Elderly, and those Recovering from Injuries. Height is adjustable from 33" to 37"
Don't miss out! Click the "Add to Cart" button now. Please NOTE: Care should be taken when using any walking stick on wet floors, tiles and other slippery surfaces. FOLDING CANE: Has a pivoting low-profile Quad Base to provide better traction and support while giving you the flexibility to walk and turn easily. The Folding Cane Stands up on its own. DURABLE: Strong while being Lightweight at less than one pound - With a 250 pound weight capacity, this sturdy cane will provide support for everyday use. EASY TO USE and STOW AWAY: Opens fully and locks into place to use and Folds up to store in seconds. The wrist strap snaps around the sections of the cane keeping them securely together when the cane is folded up. Perfect Fall Prevention and Mobility Aid for Home and on the Go. Great for travel since it fits easily in handbags, luggage, backpacks, or the car. If you have any questions about this product by Enable Medical Supply, contact us by completing and submitting the form below. If you are looking for a specif part number, please include it with your message.